Today, Bucket and The Kitten received a parcel (addressed to them personally, of course). 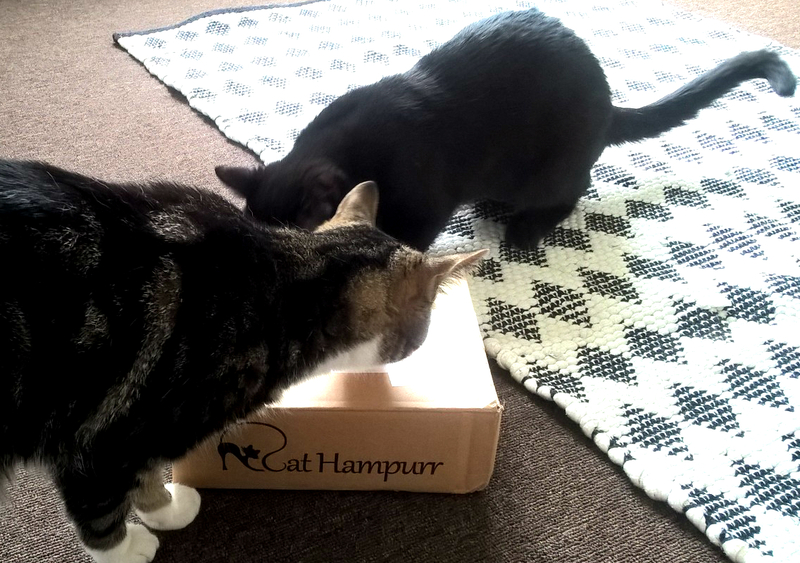 The lovely team at Cat Hampurr, had asked whether the cats would review the contents of one of their monthly subscription boxes, and of course, whilst I doubt these two represent the average family cat - I said yes! There's one reason that I've never looked in to a Cat Hampurr subscription for the cats before, and that is Bucket's fussy eating habits. It's not that he has expensive taste and will only eat the very best: quite the opposite, he's only interested in dried cat food, and the cheaper, cackier dried cat food I can find him, the better. Thankfully, he does eat the dried cat food that we buy from the vets, which is independently produced without grains, and has nothing horrible in it, but manages to appeal to his awful taste. He won't eat fresh fish, or meat, or anything most cats would risk their lives for. I can confidently leave a whole side of salmon out in the kitchen and know that Bucket won't pay it the slightest bit of attention. He also despises all cat treats, and wet food. The only exception to his rule is peas, there is very little that he wouldn't do for a bowl of peas. 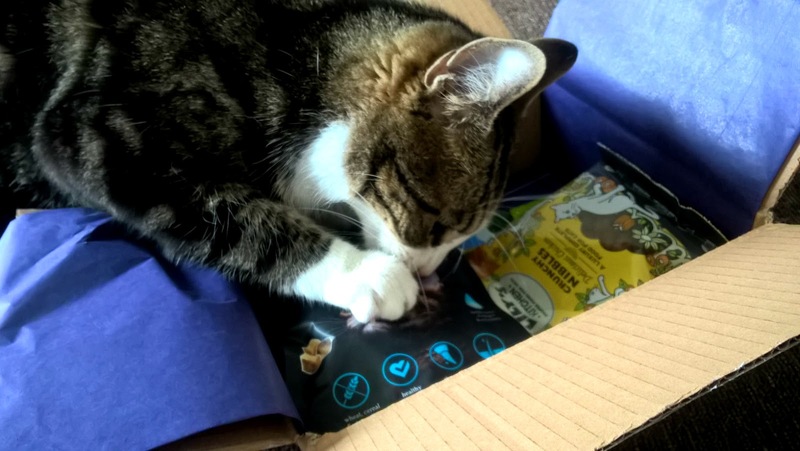 So a subscription which aims to introduce you to the best, healthiest and most innovative cat food products on the market, is completely wasted on him. The Kitten, on the other hand, will usually eat anything, including small potted plants. A Cat Hampurr however does include toys, so you'd think, oh well, Bucket can have the toys then... except he doesn't really like cat toys (I know, I know). Bucket only really likes playing with screwed up paper, and he really likes playing with screwed up paper: but somehow, I didn't think that Cat Hampurr would include such a speciality. 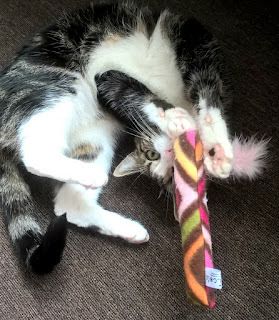 The Kitten, on the other hand, enjoys cat toys very much (his favourite cat nip caterpillar has recently been discreetly disposed of and replaced with a trio of cat nip mice) - so really, I supposed that the entire box would be for The Kitten. I wasn't entirely right though. First of all, Bucket went straight in for one of the toys, a Kitty Kick Stick by Clasicats. This is the sort of thing I'd totally disregard usually as I wouldn't expect him to show the slightest interest, but I suspect that the "luxury, maximum strength, fine cut Canadian catnip" might have something to do with it. The Kick Stick is a long sturdy stick made from high quality fleece, and is twice sewn for added durability. It also has a marabou feather "tail", which is the sort of thing The Kitten goes in for on toys (the trio of mice used to have feather tails). Both cats have enjoyed playing with the Kitty Kick Stick, the quality of the catnip is obviously far superior to what they're used to. 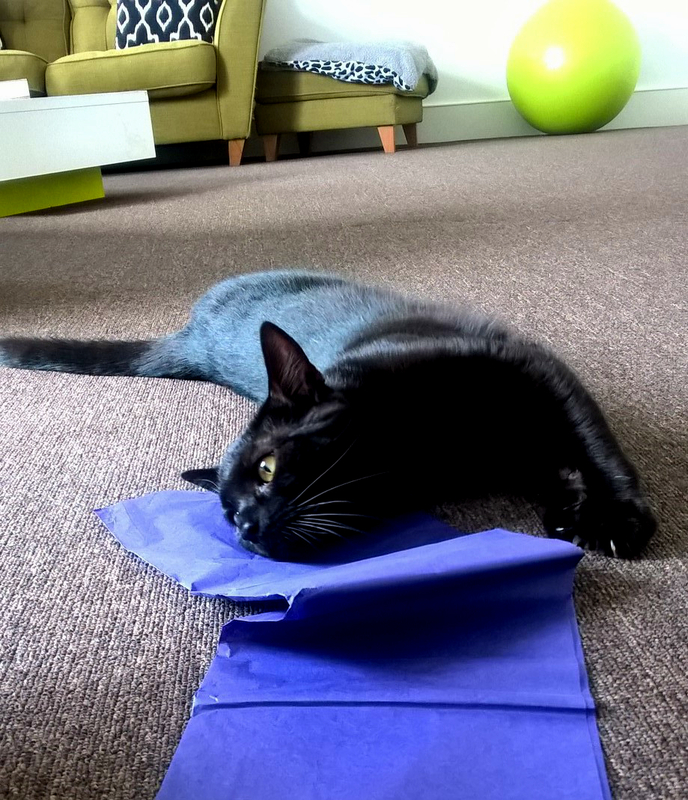 The Kittens absolute favourite part of the Cat Hampurr was the purple tissue paper packaging... 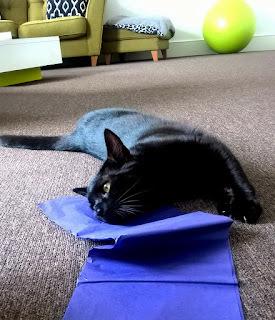 I think it must have smelt rather heavily of the cat nip from the Kitty Kick Stick, because he is still rolling around on the paper now, and it's covered in dribble. A close second on favourite items though, was the Angora Bunny Ball, from Reclaimed by Nature. Both cats have enjoyed this too. Unlike most of the balls I've bought them (which have gone ignored), the Bunny Ball is made from British sheep's wool, which is coated in layers of soft angora rabbit fur (a bit indulgent for a cat toy perhaps). The angora, for those who (like me) are concerned, comes from a British angora rabbit farm where the rabbits live outdoors in large runs, not in tiny cages, have regular human contact and are clipped with scissors. None of the horrors of Asian and European angora factories that make jumpers. On toys - a massive thumbs up (from me; cat's have no thumbs - apart from Tipsy, Boyfriend's sister's cat, who does have thumbs - weird). Food stuffs was harder work. In the Cat Hampurr were two different types of treat, some air dried British venison slices (basically like biltong for cats) from The Innocent Cat, and some freeze dried fish fillet treats from Pet Munchies. Neither cat was interested in the venison, even though I was half tempted to try some myself, it looked pretty good, and only The Kitten will eat the fish fillet bites; but there are no surprises there. Also in the Cat Hampurr, were two portions each of two different brands of complete cat food, one wet, one dry. The dry cat food, by Lily's Kitchen, is actually a huge hit with Bucket (yay!). Described as "crunchy nibbles", they're flavoured with chicken, and are entirely grain free. They're also made in the UK, and are apparently very tasty. Basically, they have all of the merits of our current cat food, but I'm just pleased to have found something else that Bucket will eat that isn't complete rubbish! This was the first time I ever witnessed Bucket push The Kitten off of food (The Kitten is usually the dominant of the two) so he must really like it! The wet food, by Forthglade, came in two different flavours, Turkey & Duck, and Chicken & Duck. I served both at the same time to see which either cat would be drawn to, but, surprisingly neither of them like either of the flavours! The Kitten licked the Turkey & Duck meat a few times and then left it, and they both smelled the bowls with each flavour in, and then left the room. This is odd as The Kitten usually LOVES it if I buy him wet food as an occasional treat. Annoyingly, they're unable to tell me what it is about this wet food that they don't like! It does, however, have a very high meat content, no grains, it's made in Devon, and contains all natural, locally sourced ingredients, so they sound fab - what a shame! So it seems the toys are also a lot easier to buy online than the food items, you might find the food in your local pet store (independent pet stores with a good range of natural, high quality pet feeds seem your best bet) but information on where to buy seems pretty hard to get your paws on. I'll definitely be buying a new Kitty Kick Stick when this one dies, the price seems very reasonable for a handmade cat toy and I'm all for supporting small businesses and craftspeople. 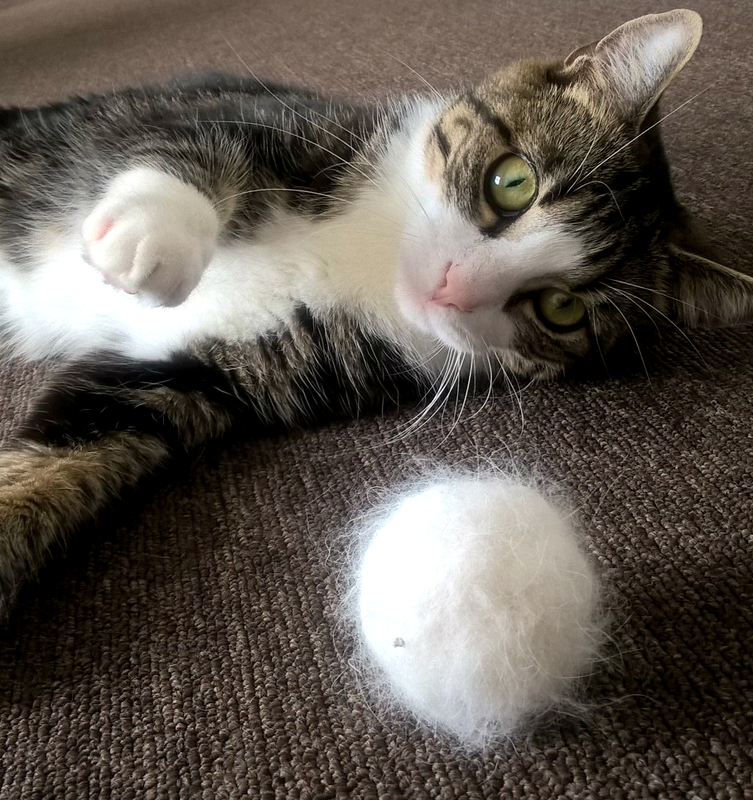 £8.00 seems quite a lot for a ball for the cats to play with (especially when Bucket is so happy with paper) but the angora bunny ball is probably a present I'd buy a friend if they got a new kitten, as a bit of a treat! 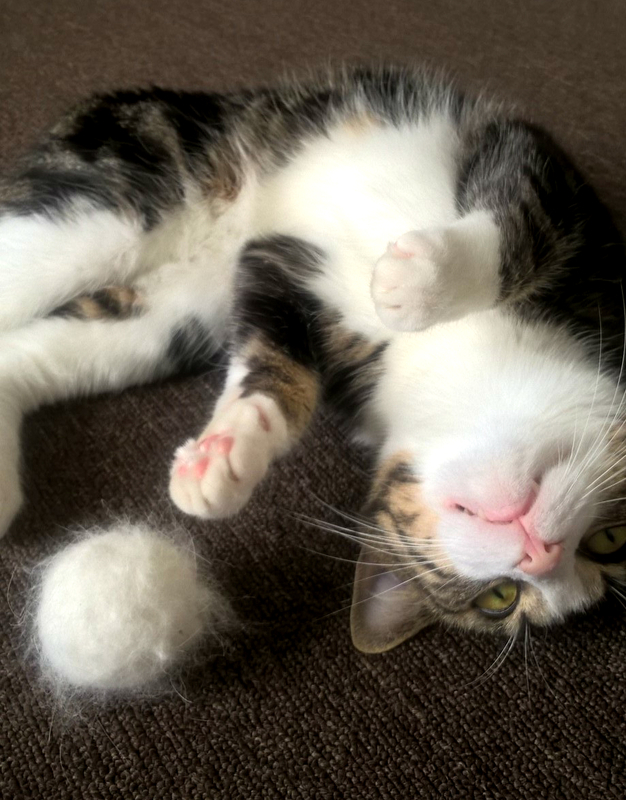 When you consider the materials used and the fact that the ball is needle felted by hand, which is time consuming, you can appreciate the price tag, but amusing as my cats are, I don't think I like them enough to make this a regular purchase! Overall, I'm really impressed with the range of samples and full sized items that we received from Cat Hampurr. The toys were definitely a hit, my only concern would be with paying to continue to discover how much food Bucket doesn't like, and I was surprised to find two items in the box which The Kitten, who has never ever turned down anything in his life, didn't want to eat. 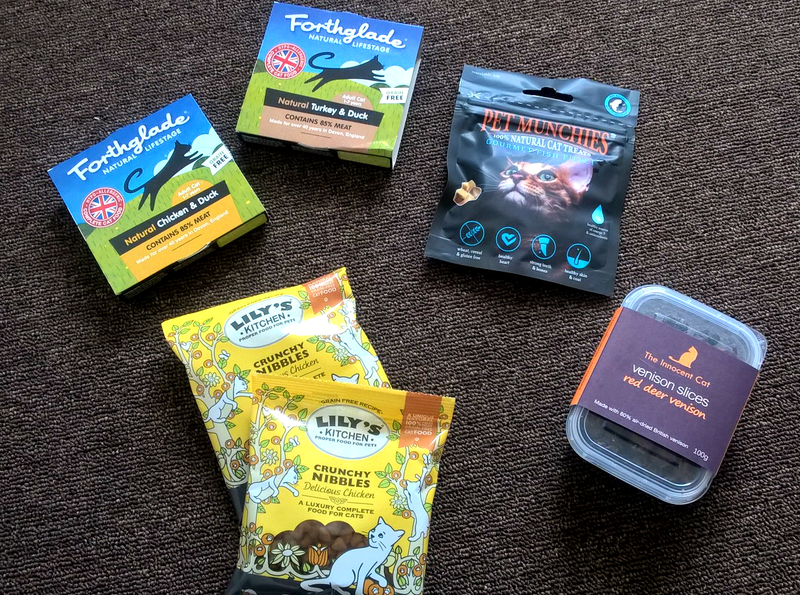 A monthly hamper is £11.95, or you can opt for a "Double Helpings" hamper to cater for two cats at £21.90. I'd probably go for the single £11.95 hamper, even for two cats, as the idea is only to find out what your cats make of the new products, allowing you to decide whether to repurchase. The toys can be shared - I'm not sure it would be necessary to have two of each. With this particular box you basically cover the subscription cost with the RRP of the toys, and you get the postage plus all of the food samples thrown in for free (I like to look at things in that sort of manner). If you have the money on a monthly basis to subscribe to the hamper delivery service, you'll get different products each month and I think I'd probably begin to look forward to the package arriving even more than the boys would!